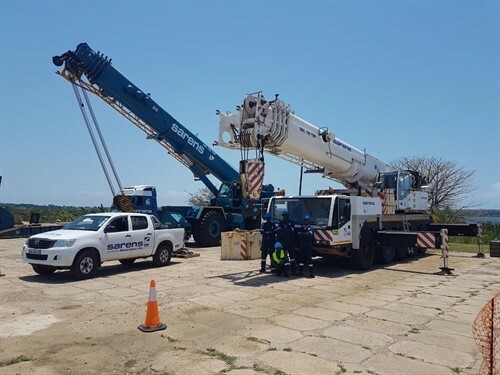 The Sarens Group has just announced the opening of a new branch depot in Mozambique near the city of Palma in the far north-east of the country. This new location is a part of the group’s strategy to ensure a permanent presence in the country with a view to the future LNG project in Mozambique in 2019. Sarens has already brought its 120T and 60T rough terrain, 100T all-terrain, and truck and trailer equipment to the site. Construction of the new 5,600 square meter depot is about to begin and will include accommodation, training facilities, office and workshop containers, workshop facilities, washing bay, laydown area, parking area …. In addition, Sarens has made the choice to invest in the training of the local population. Thus, the group has already trained and certified three crane operators.